Bihar is located in the eastern part of India. The state is surrounded by Nepal in the north, West Bengal in the east, Uttar Pradesh in the west and Jharkhand in the south. The state enjoys a unique location specific advantage because of its proximity to the vast markets of eastern and northern India, access to ports such as Kolkata and Haldia and to raw material sources and mineral reserves from the neighbouring states. 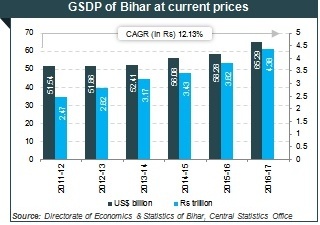 The Gross State Domestic Product (GSDP) of Bihar grew at a CAGR of 11.99 per cent between 2011-12 and 2017-18. 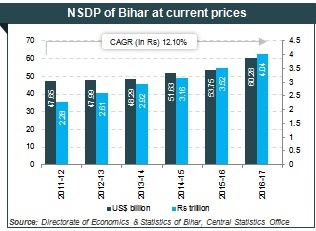 Bihar's per capita GSDP increased from US$ 490.62 in 2011-12 to US$ 655.42 in 2017-18 at CAGR of 10.25 per cent. Bihar is one of the strongest agricultural states. The percentage of population employed in agricultural production in Bihar is around 80 per cent, which is much higher than the national average. It is the fourth largest producer of vegetables & the eight largest producer of fruits in India. Food processing, dairy, sugar, manufacturing and healthcare are some of the fast growing industries in the state. The state has planned initiatives for the development of other sectors such as education and tourism and also provides incentives for information technology and renewable energy. The state enjoys a unique location specific advantage because of its proximity to the vast markets of eastern and northern India, access to ports such as Kolkata and Haldia and to raw material sources and mineral reserves from the neighbouring states. The state has a large base of cost effective industrial labour, making it an ideal destination for a wide range of industries. Total FDI for Bihar & Jharkhand, between April 2000 and December 2018, stood at US$ 113 million. Total merchandise exports from the state stood at US$ 1,345.31 million during 2017-18. During April-December 2018, the exports stood at US$ 1,243.34 million. As of April 2018, work on NH2 in Bihar has been started. Total cost of the project is estimated as Rs 882 crore (US$ 136.85 million). In 2018-19**, Patna handled 25,866 aircraft movement, 3,726,697 passengers and 10,402 MT freight. As on April 2018, under the AMRUT scheme, total amount of Rs 2,469.77 crore (US$ 383.21 million) were allocated to the state of Bihar. Total horticulture production in the state for 2018-19^ was 21,204.97 thousand MT with 1,185.36 thousand hectares of area under production. State produced 6,787.8 thousand MT of rice and 62 thousand MT of pulses in 2018-19^. In 2017-18(P), Bihar produced 16.51 million tonnes of sugarcane. The foreign tourist arrival in Bihar in the year 2018* was around 0.77 million. Domestic tourist arrival in the state stood at 18.72 million during the same time.